← Does the Putin-Trump Handshake Mean Peace For Syria? What has gotten John Podesta freemason apron in such twist? Was it the following tweet by President Trump? All Trump did was tweet the honest truth about Podesta’s monumental failure to turn over the server to the proper authorities for investigation after the reported leaks à la WikiLeaks. Now exactly why wouldn’t Podesta do that? Why did he refuse to permit any law enforcement authorities to check out the server to identify the dangerous cyber-culprit? Who wouldn’t want the FBI forensic investigators — highly skilled in this particular type of cyber-crime — to take possession of the server … … … unless there was a LOT more on that server that needed to be kept strictly private and confidential. The following link contains much more incriminating evidence than the suspicious email posted below that was sent by John Podesta to his brother Tony and his wife Mary. If this scandalous content is representative of similar information on the DNC server, it would certainly explain why Podesta would also not turn over his IT devices. After the FBI formally announces an investigation on July 25, the DNC refuses to turn over the concerned servers to the FBI or any other law enforcement agency to conduct the proper forensic investigation. Guccifer 2.o is suspected of conducting the hack but the attention is nevertheless turned toward Russia. The more the Clinton campaign falters, the more Russia is falsely accused of the hack. It’s true that the extremely damaging information contained in the DNC emails put Podesta and the campaign in a 24/7 damage control mode. DNC Chair Debbie Wasserman Schultz and 3 other senior officers were forced to resign. At the end of the day, the motherlode of strictly confidential emails literally upends the Clinton’s campaign. And Hillary loses in what is universally termed an ‘historic’ loss. In the face of the humiliating defeat comes a stone-cold guilty John Podesta looking to deflect blame that he should have borne as campaign chairman. Not only did his emails reflect a manager who was completely inept and out of touch, they exposed exceedingly serious conspiratorial criminal conduct. This is when the DNC really started to scream “Russia did it!” at the top of their lungs. While this attempt was successful at first, Pizzagate gained so much traction in the Alt Media that there was no stopping what is now the largest citizen investigation in human history. Much more significantly, the Washington, D.C.-centered Pizzagate investigation evolves into a worldwide project exposing Pedogate—“A Global Child Trafficking and Exploitation Crime Syndicate”. PEDOGATE: Pandora’s Box Has Been Opened for Deep State and the C.I.A. The “fake news” meme eventually boomerangs back onto the MSM. President Trump uses it weekly to remind the American people that the daily news cycle is full of MSM-produced fake news. Because of this constant reminder by Trump and the Alt Media, Deep State relentlessly uses the fake Russia hack story as a weapon. And the MSM artificially keeps the phony conspiracy alive without ever providing any proof whatsoever. Particularly in view of the “nuclear fallout” of these events, it’s clear that John Podesta had the most to lose of all the parties concerned. And, boy, does he have a LOT to lose, including his freedom of movement! So, what are Podesta’s real concerns here? • First and foremost, Podesta would be accused of having the greatest responsibility for Hillary’s epic loss which she would never own up to. As chair, not only was it his job to win at all cost, losing to Donald Trump only added insult to injury. 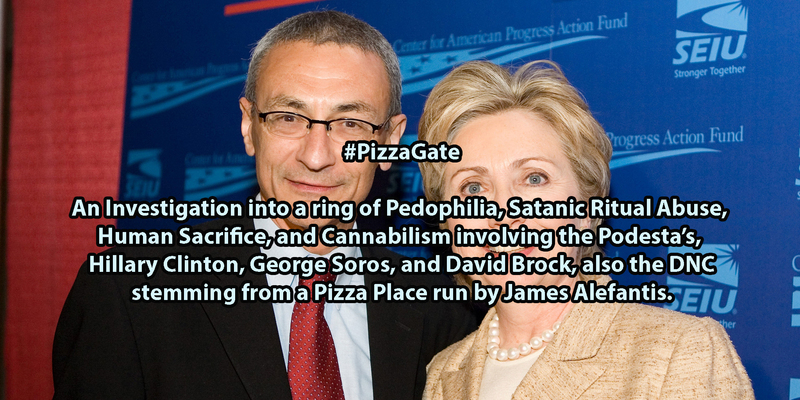 • Secondly, many of Podesta’s own emails proved to be very suspicious and revealed his deep involvement with Pizzagate criminal activity. The veritable crime wave associated with Pizzagate continues unabated, as does the investigation of Podesta and his co-conspirators. And he knows it. • Thirdly, Podesta’s shocking failure to ensure adequate cybersecurity for the campaign led to the unprecedented string of 2016 election losses by Democrat candidates nationwide. Those election defeats continue to this very day partially due to the exceedingly sordid email revelations. Now we come to the real plot behind the patently false and purposefully contrived Russian hack story. John Podesta and the like are really being used by the New World Order cabal that has the most to gain from a Russian boogeyman. The ruling cabal will do anything possible to prevent Trump and Putin from coming together. Their worst nightmare is world peace. Deep State not only controls the entire planetary civilization via the perpetual war economy, it would collapse in a world without war and conflict. Herein lies the single most important reason for the unending fake news about Russia. The same crowd of Neocon warmongers is desperate to trigger a war with Russia as a prelude to the hot phase of World War III. And the election hack ‘story’ has done a lot to turn the average American against Russia and President Putin. This stealthy strategy has slowly put the US citizenry on war footing. All of the military buildup on Russia’s borders and bellicose posturing by the European pawns (from both presidents and prime ministers) has also been carried out toward this end. The bogus Russian hack narrative has even been used by the same EU leaders to influence and scare people across Europe during their respective elections. John Podesta knew from the very beginning that Russia had nothing to do with the hacking of the DNC servers. Nonetheless, he took every opportunity to aggressively push the fictitious story out there. Podesta was well aware that his political future was at stake. So was his livelihood given the sheer criminality of Pizzagate (see link below). Podesta also knew that CrowdStrike would be the only company given access to their servers. The Co-Founder and CTO of CrowdStrike is Dmitri Alperovitch who is suspected of working for Ukrainian Intelligence. This CIA-contractor is the preferred cybersecurity company for manufacturing false evidence against selected target. They can concoct a spurious case against any party, and they do whenever the U.S. Intelligence Community so orders it. 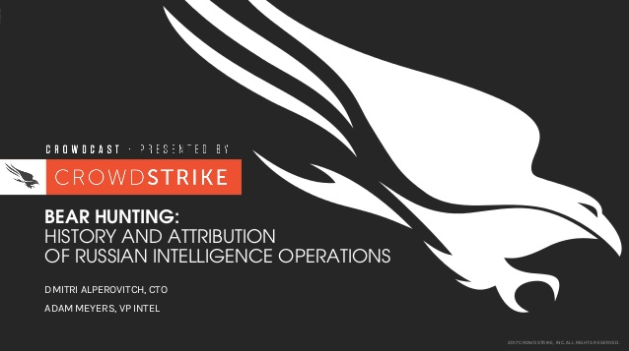 From the very start it was clear that CrowdStrike would build a counterfeit case against Russia since their whole MO revolves around “hunting Russian bear”. The following exposé delineates just how easy it is for a cyber-technology firm like CrowdStrike to operate such a fraudulent investigation arm. CONFIRMED: DNC paid the ‘Russian’ founder of CrowdStrike to hack its server so it could be blamed on Russia! In John Podesta Deep State has found an exceptionally willing agent. Not only has he been a used to manipulate Presidents Clinton and Obama when he served in their administrations, he also functioned as Deep State handler of Candidate Clinton. Only a dyed-in-the-wool NWO globalist could function as the campaign chairman for the cabal’s choice to further advance the Obamanation. This is exactly why Podesta et al. made up the Russian hack story out of thin air. They were that desperate to see Clinton win and to ensure a Trump defeat. No other politico inside the Beltway has worked so hard to keep this fake news story alive as Podesta has. Even without a shred of evidence, this Jesuit-trained operative shamelessly maintains the false allegation. Whenever there is a profound personal reason to promote an untrue accusation, which then marries up with a similar institutional agenda, there is no stopping the ruse. However, there always comes a day when truth will break out into the open just like the sun does after a thunderstorm passes by. Once that happens, this whole game will change overnight, and those who have borne false witness will inevitably be held accountable. 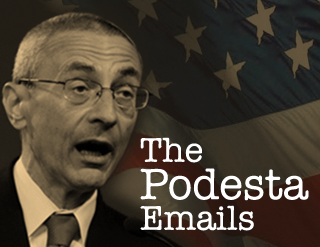 As much as anyone associated with Pizzagate and Pedogate, fake news and the Russian hack story, John Podesta must be prosecuted to the fullest extent of the law. His entire criminal network needs to be shut down post-haste. And the world community of nations ought to be apprised of these furtive machinations designed to start a World War.